President George W Bush's attempts to overhaul the US's immigration laws have collapsed in the Senate, derailing one of his central policy planks. Senators voted against keeping the bill alive, effectively delaying action on the emotive immigration issue until after the 2008 presidential election. 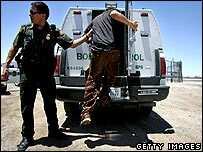 The proposed legislation set out ways for some of the around 12 million illegal immigrants to seek citizenship. The bill's opponents said this amounted to an amnesty for breaking the law. Hours before the vote, the Capitol's switchboard was jammed by thousands of calls from groups and individuals arguing both for and against the bill, signalling its deeply divisive impact. "The American people won today. They care enough for their country to get mad and to fight for it," said Republican Senator Jim DeMint. Backers of the bill expressed their deep disappointment. Democrat Senator Edward Kennedy insisted the immigration reform was inevitable, although it might take years. Referring to the legislation's opponents, he said: "What are they going to do with the 12 million who are undocumented here? Send them back to countries around the world? Develop a type of Gestapo here to seek out these people that are in the shadows? What's their alternative?" As well as allowing some illegal immigrants to eventually seek citizenship, the planned legislation would have also offered some would-be migrants the chance to apply for a guest-worker programme. The bill also proposed tougher border controls to prevent more illegal immigrants from entering the country. 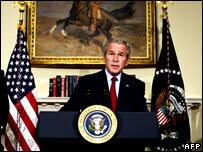 President Bush spent much of Thursday morning on the phone, trying to persuade senators to back the bill. As the vote neared, Homeland Security Secretary Michael Chertoff and Commerce Secretary Carlos Gutierrez approached senators directly outside the chamber in an effort to win them over. Eventually, 53 members of the 100-seat Senate voted against limiting debate on the immigration bill and taking it to a final vote. In a brief statement after the vote, President Bush said immigration was a burning issue for the American people and "Congress' failure to act on it is a disappointment". "The American people understand the status quo is unacceptable when it comes to our immigration laws," he said. "A lot of us worked hard to see if we couldn't find common ground. It didn't work." The Senate now goes into summer recess. Mexican President Felipe Calderon said the US Senate had made a grave error. "The US economy cannot keep going without migrant labour," Mr Calderon said. Business leaders and lobbyists for immigration reform voiced upset at the result. "We were looking to politicians for leadership on this issue, and there has been none and it's deeply disappointing," Sheridan Bailey, a co-founder of Arizona Employers for Immigration Reform, told Reuters news agency. "It's like in Vietnam when they said 'we had to destroy the village to save it,' - well, here they are destroying the economy to save the US border." But opponents of the bill said the vote highlighted citizens' concerns that boosting border security was the biggest priority. Americans want "action, they want results, they want proof, because they've heard all the promises before," Republican Senator David Vitter told AFP news agency. How should the US handle it?